In general, in a summer, it is possible to take a child in a baby carrier. In winter it can be very cold and windy and therefore it is not recommended to take a child under 3 years old for the hike. 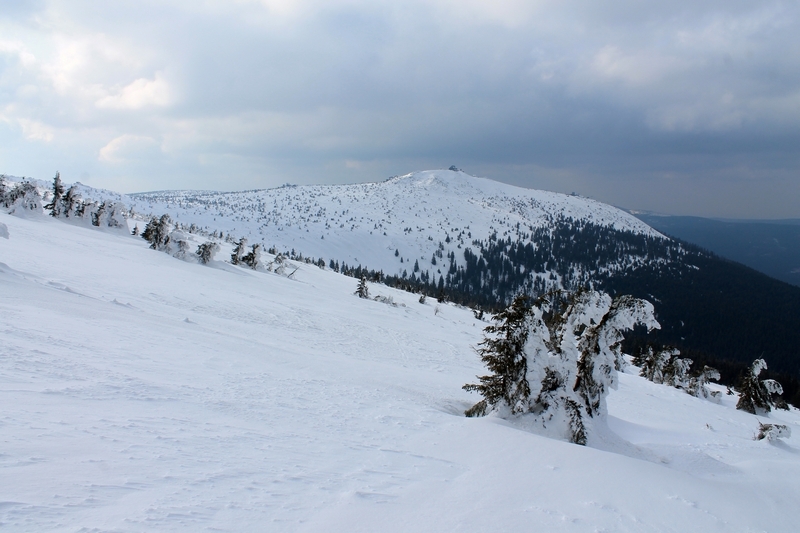 *The same conditions for the reduced fee as for prices to Karkonoski Park Narodowy (Giant Mountains National Park). More information about it can be found under Safety Tips section. Get off the bus on the main bus station in Szklarska Poręba (Główny Dworzec Autobusowy) and then walk along Jedności Narodowej Street towards City Hall (Urząd Miasta). On the crossroad by the City Hall there will be a sign pointing to Wodospad Kamieńczyka (Kamieńczyka Waterfall). Keep on walking along the main street until you cross a bridge over large Kamienna river. You should be able to see the parking area next to Kamieńczyk Waterfall from that spot. Reaching the first attraction in the National Park will take around 30 minutes. Wodospad Kamieńczyka (Kamieńczyka Waterfall) is the longest waterfall in Polish Karkonosze (Giant Mountains) situated at a height of 840 m.a.s.l. Water drops there from the height of 27 metres. Watching from the top is free of charge, however, for a small entrance fee to beautiful Wąwóz Kamieńczyka (Kamieńczyk Gorge) you can admire the cascades from the bottom of the ravine. The second option allows you to feel the power of water gushing down the rocks. The gorge is very narrow with high vertical walls. For safety reasons, each visitor receives a helmet that needs to be worn at all times. At the top just by the waterfall is Kamieńczyk hostel (schroniskokamienczyk.pl).This place serves delicious food and can host 15 overnight guests. In addition, it is an ideal spot for the first respite before an exhausting 65 minute walk uphill. In addition, behind the building you will have the first chance to see the magnificent panorama of Kotlina Jeleniogórska (Jelenia Góra Valley). After recharging your batteries, get back on track and follow the red trail. Shortly after you leave Kamieńczyk hostel behind, prepare cash for the admission to the National Park as a little wooden ticket booth lurks ahead. Following a lengthy trek, eventually you will reach Hala Szrenicka shelter (Hoarfrost Highland Ley shelter, www.hala-szrenicka.com) that offers 110 beds and really tasty food. During winter, proximity and easy access to ski lifts makes this place also an excellent lodging point for ski enthusiasts. Hike up the hill for a little bit longer, your next stop point is only 15 minutes away from here. 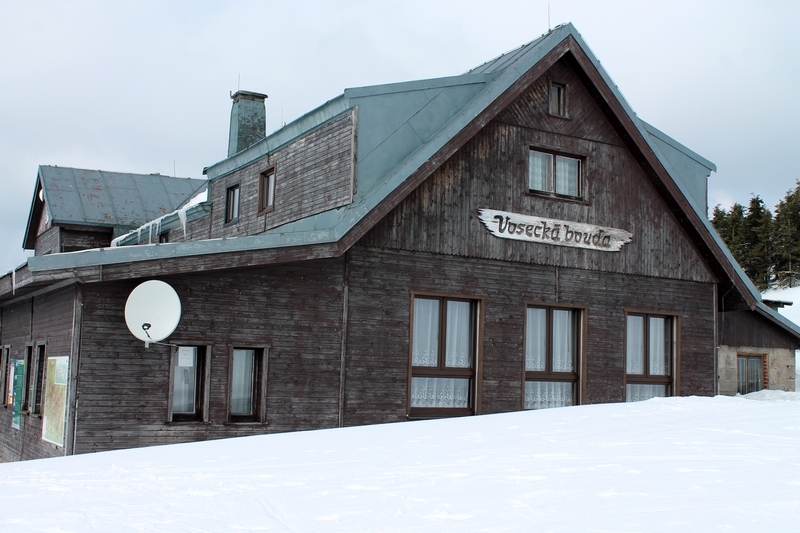 At the top of Szrenica (Hoarfrost Summit) you will find yet another mountain hostel that bears a name of the peak. 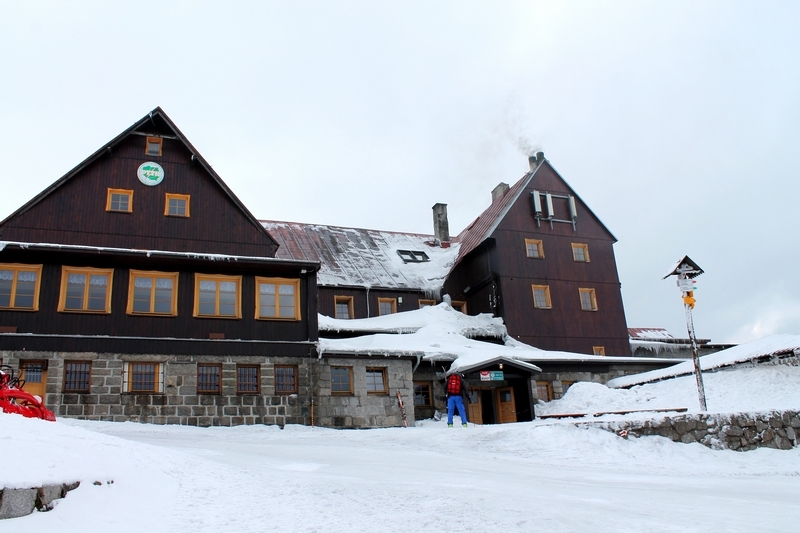 Szrenica shelter (Hoarfrost Summit, szrenica.pl) serves delightful food and can accommodate 90 guests who plan to stay for a night. Additionally, the place is famous for its unique tranquillity and scenic views with breathtaking sunsets. Certainly, it is worth spending more time here and relish the scenery of Kotlina Jeleniogórska (Jelenia Góra Valley) on the Polish side and mountainous panorama of Czech Republic. Return to the red trail and move in the direction of Śnieżne Kotły (Snowy Cirques). 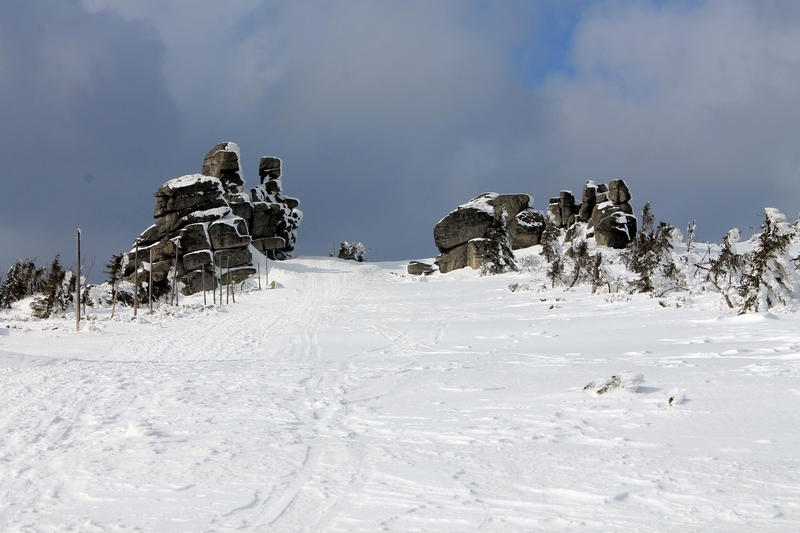 On your way to the corries you will encounter two groups of peculiarly shaped rocks. The first one, Trzy Świnki (Three Piggies) and within a short distance from it the second one called Twarożnik (Quarkstone). 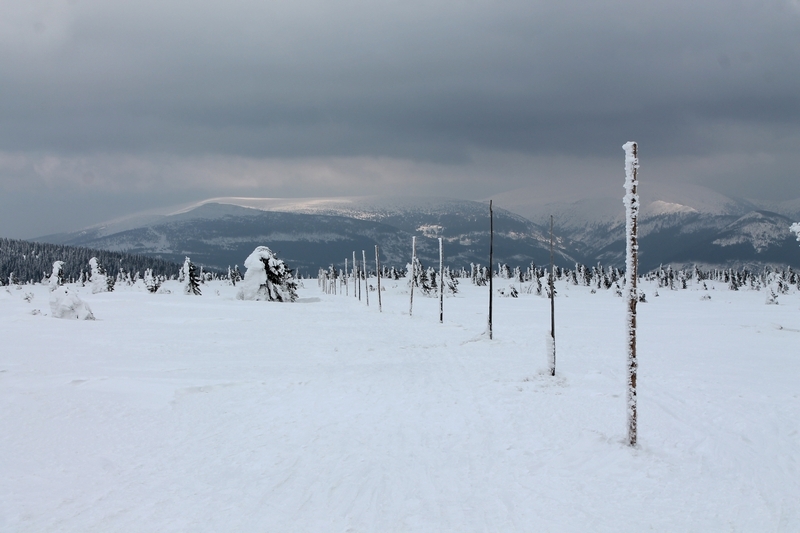 Shortly after passing Trzy Świnki (Three Piggies) turn right by the long wooden poles that are trail markers during winter. Walk along the rod path for about 15 minutes until you reach Czech hostel Vosecká Bouda (voseckabouda.wz.cz). The place can accommodate 37 travellers who would like to sleep over. 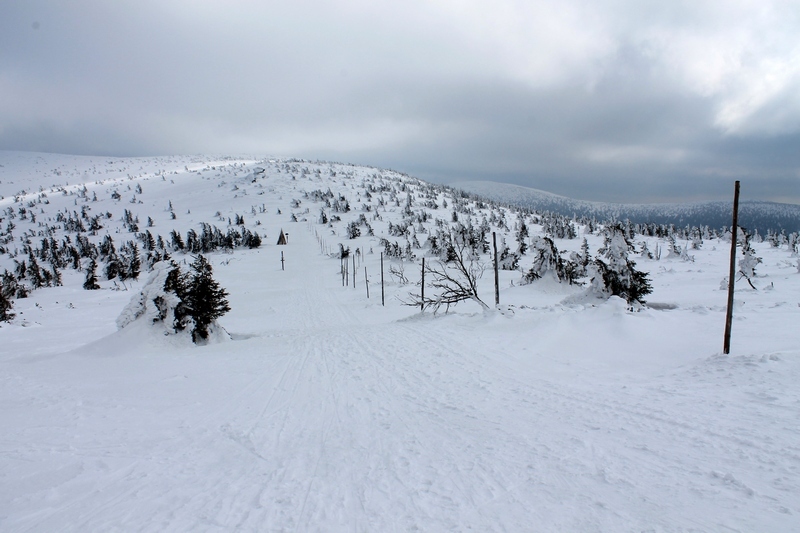 From this spot the vista of Czech Karkonosze (Giant Mountains) (Czech Giant Mountains) will take your breath away and keep you amazed for a long time. 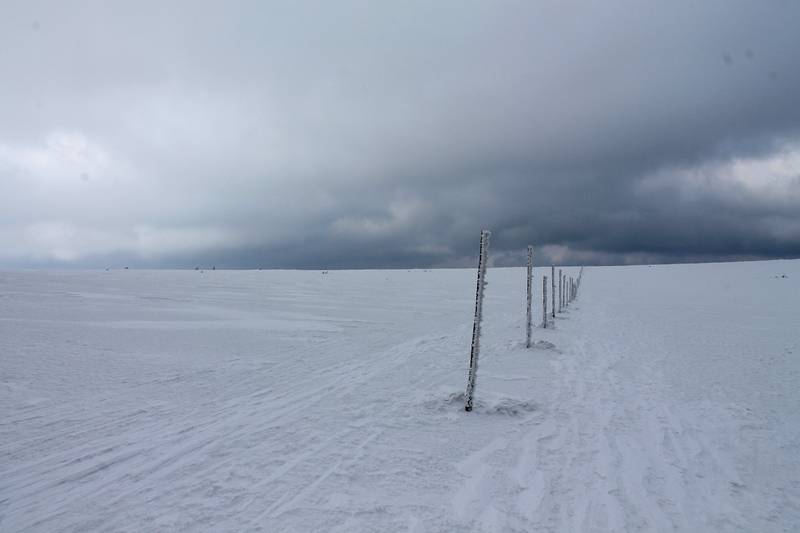 This place is also accessible from the junction where the red trail coming from the direction of Śnieżne Kotły (Snowy Cirques) is joined by the yellow one. The crossing is only 10 minutes away on foot from the hostel. Next part of our walk leads through Czech part of Karkonosze along green hiking trial markers in the direction of Labská Bouda. About 1 hour stroll gives us opportunity to marvel at wonderful panorama just behind the border. This path is also frequently used by cross country skiers. Mind their tracks and try to not damage them. In around an hour time, you should reach a point where the green trail meets the yellow one. If you would like to skip a visit at Labska Bouda turn left and follow the yellow trail until you reach the red one which is called Główny Szlak Sudecki (Sudety Main Trail). 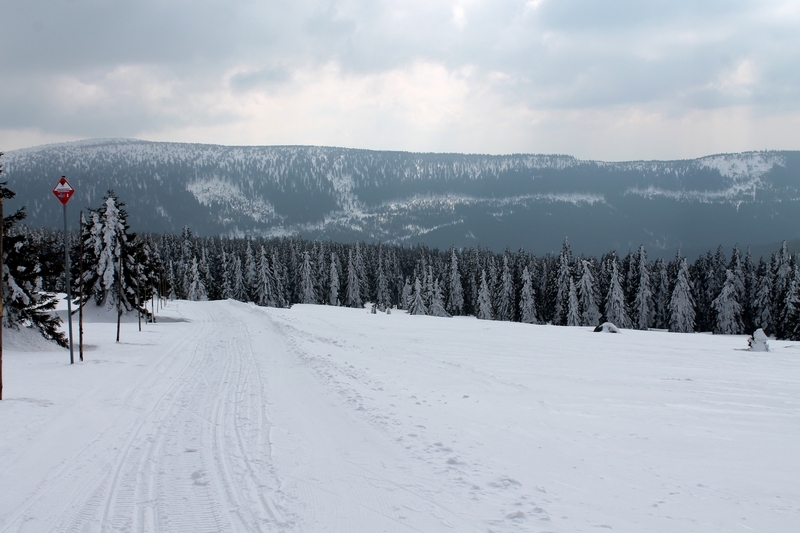 However, if you are eager to visit the hotel go straight on the junction which is a winter path leading to Labska Bouda (labskabouda.cz). This large Czech hotel offers 4 types of accommodation which means everyone can find the best offer for their pocket. The building is situated over a rocky valley called Labský Důl, in close proximity to Pramen Labe (Spring of Laba/Elbe river). It is a perfect spot to admire a beautiful view on the entire vale. Descending into the cirque is forbidden during winter but you may always come back here in the summer or autumn. Whenever you are ready to continue your trek, take the green trail in the direction of Pramen Labe (spring of the river Elbe). 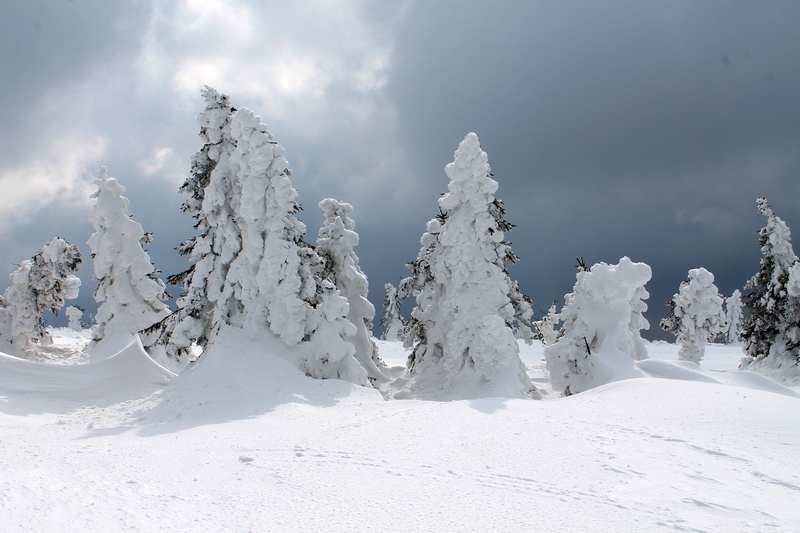 Unfortunately, in winter the Laba/Elbe spring is covered with snow so you will not be able to see it but let it be just another reason for you to return here in a warmer season. From this point take the yellow trail until it joins Główny Szlak Sudecki (Sudety Main Trail) marked red. At this point Główny Szlak Sudecki (Sudety Main Trail) runs along the Polish and Czech border, cut across it and move straight on following the winter trail marked by wooden posts in the direction of Schronisko Pod Łabskim Szczytem (Shelter under Laba Summit, labskiszczyt.pl). This hostel offers 38 beds and serves meals from 8:00 until 20:00. An extraordinary night awaits for those who decide to stay there after sunset. Since there is no fixed electricity installed, a light supply is limited and comes from a power generator during afternoon hours. The owners kindly request all visitors to bring candles to illuminate the lodge after the generator is switched off. There is no better way to experience the spirit of mountains than sitting in the main room heated up by a fireplace and talking to other travellers in the dim candle light. During the day, you may enjoy the fantastic view on Kotlina Jeleniogórska (Jelenia Góra Valley) while sitting in front of the building. 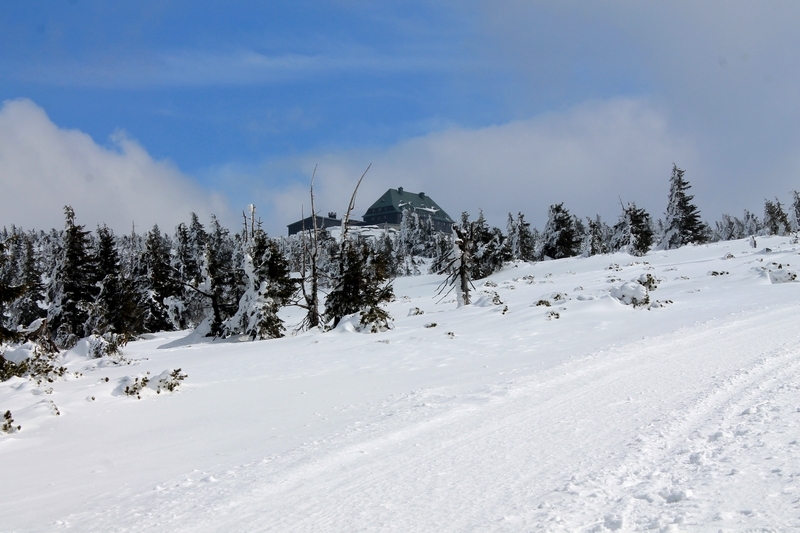 Whenever you are ready, take the yellow path and start descending towards Szklarska Poręba. On your way back you will encounter another group of granite rocks named Kukułcze Skały (Cuckoo's Rocks) which rise up for around 7 metres. From here you will also be able to see Borówczane Skały (Blueberry Rocks) in the distance. The end point for this trip is at the bus stop in the town centre of Szklarska Poręba.